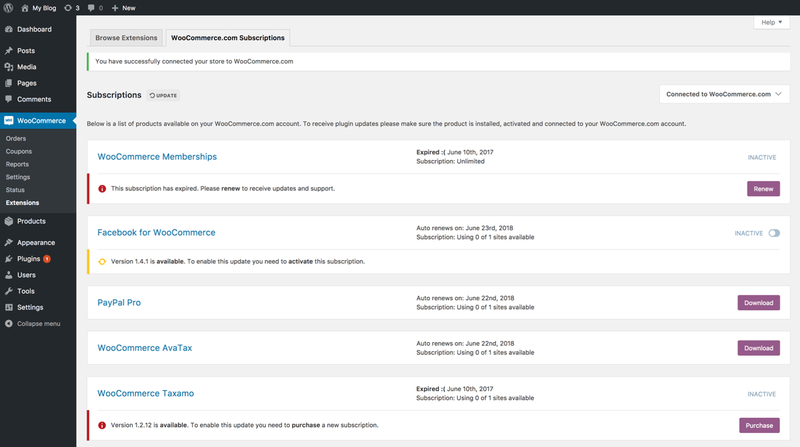 Managing the extensions you purchase on WooCommerce.com can now be done directly from within the WooCommerce plugin itself. You can also manage both the ability to transfer and share your WooCommerce.com extensions directly from your My-Account on WooCommerce.com – making it easier for you to build sites for customers, or consolidate your extensions into one WooCommerce.com account. Both transfers and sharing have specific use cases and these are explained below. Consolidating purchases across multiple WooCommerce.com accounts. Handing over a site to a client once the site/store development is finished. Transferring ownership of an extension purchased on behalf of someone a company or agency. Allow a store builder to share either a single or multi-site subscription with their client. As of WooCommerce 3.1, the former standalone WooCommerce Helper plugin was merged into WooCommerce itself. You can now connect, download your extensions and activate keys, all from one place. How can you make use of this new feature? Update WooCommerce to the latest version (from 3.1 onwards) and the new ‘helper’ will migrate the existing connection between your site and your WooCommerce.com account. 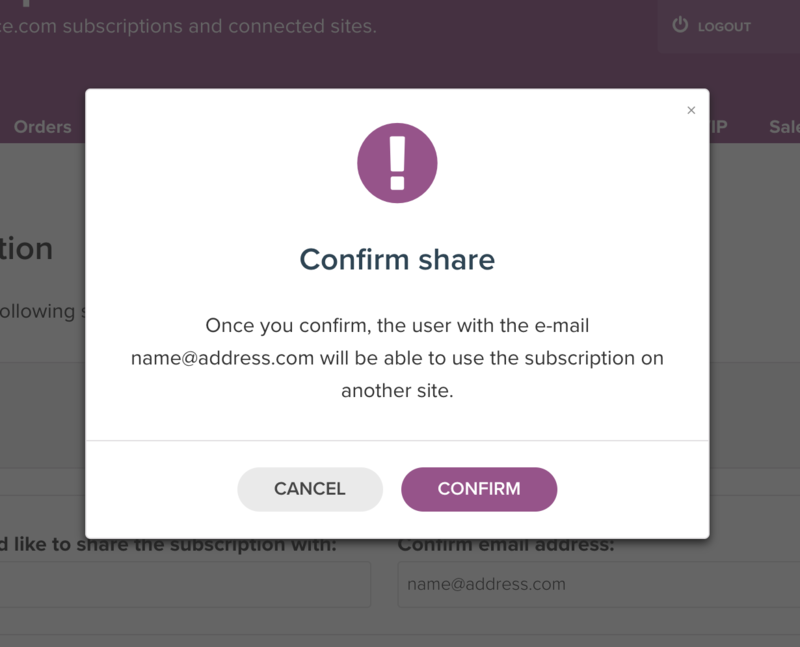 If you were sharing a subscription key (i.e., an extension you did not purchase on your own WooCommerce.com account), you need to ask the original purchaser to share that extension with you. This can be done using the sharing feature on WooCommerce.com – and you can follow these steps. 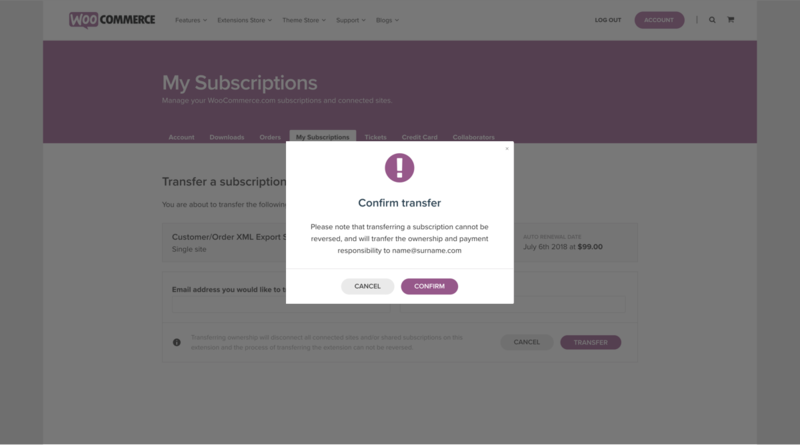 If you prefer to take ownership of extensions purchased on your behalf using a different account or have ended up purchasing products across various WooCommerce.com accounts you can transfer them to one account by following these steps, or visit our Help Desk and request a transfer of extensions between accounts. This pertain to new WooCommerce users or existing WooCommerce users who are already using version 3.1 or higher. 1/ Go to WooCommerce > Extensions. 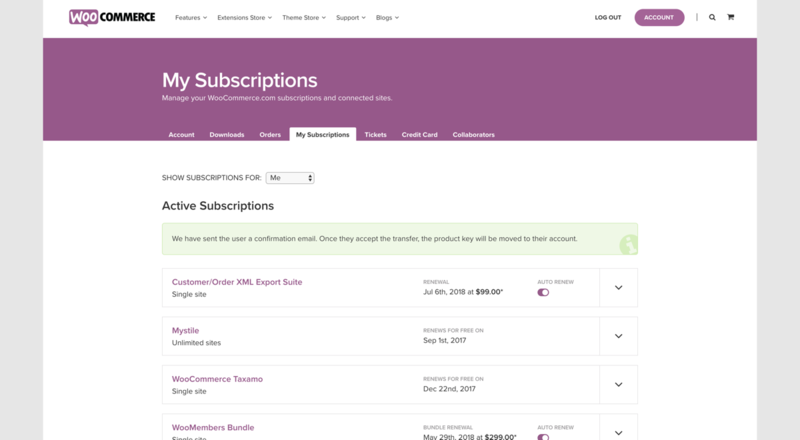 2/ Select the WooCommerce.com Subscriptions tab, and connect your store to your WooCommerce.com account. 3/ Click the Allow button to approve the connection process. 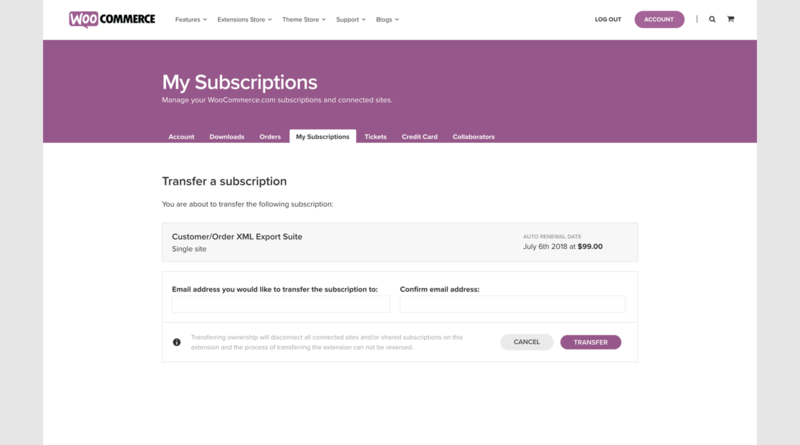 Once you have connected your store and account, any purchases made personally or shared with you will appear in your list of Subscriptions to manage. Download extensions to install them directly from your site. Activate/deactivate the subscription on your site. Receive updates and support for your connected extensions. Filter your extensions by installed/activated/download/update available. Upgrade a subscription if you reach the maximum number of activations. Enable auto-renew for subscriptions that are expiring. Purchase a new subscription for extensions that have expired. 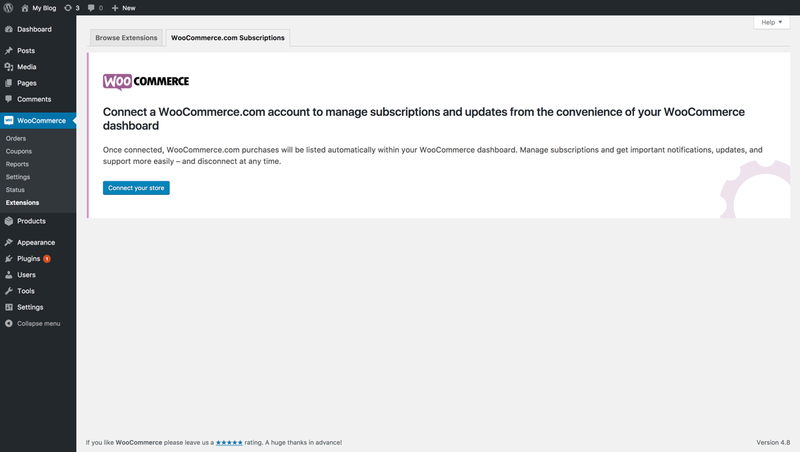 1/ Log in to your WooCommerce.com account, and go to: My Subscriptions. 2/ Select the extension you want to transfer, and click the Transfer link. 4/ Enter the email address of the WooCommerce.com account you want to transfer the extension to. 5/ Confirm the email address. 6/ Click the Transfer button. On the next screen, a prompt asks you to confirm the transfer of this extension. Please note that this transfers both ownership and billing to the new owner. 7/ Click the Confirm button if you are happy to proceed. A notification is sent to the email address you entered, asking them to accept the transfer. A notice appears that the extension transfer is pending acceptance in My-Account of the person who initiated the transfer. In My-Account of the person receiving the transfer, a notice indicates that they have an incoming transfer pending, and it can be confirmed or canceled. Once the transfer is accepted, the extension is moved from the original owner’s account to the new owner’s account. It’s not possible to “break off” parts of a 5-site and/or 25-site subscription and transfer those keys to individual clients. Why? Because the key number belongs to the full package. It is also not possible to link two different WooCommerce.com accounts to the same site as a way to share the ownership of extensions on one site. You would need to purchase a separate subscription/key for every client or have them purchase it themselves on their own WordPress/WooCommerce account if they want ownership of the extension. Or you can share a single key in a multi-site subscription using the sharing feature by following these steps; in this case, you retain ownership. 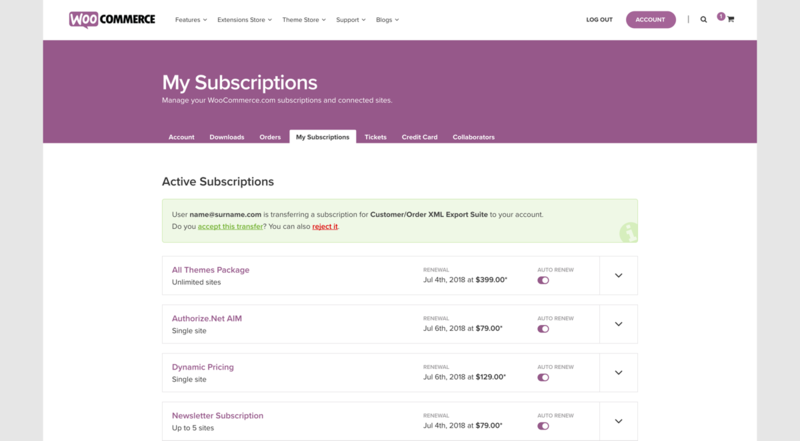 1/ Log into your WooCommerce.com account, and go to: My Subscriptions. 2/ Select the extension you want to share, and click the Share link. On the next screen, you can see the subscription you are about to share. 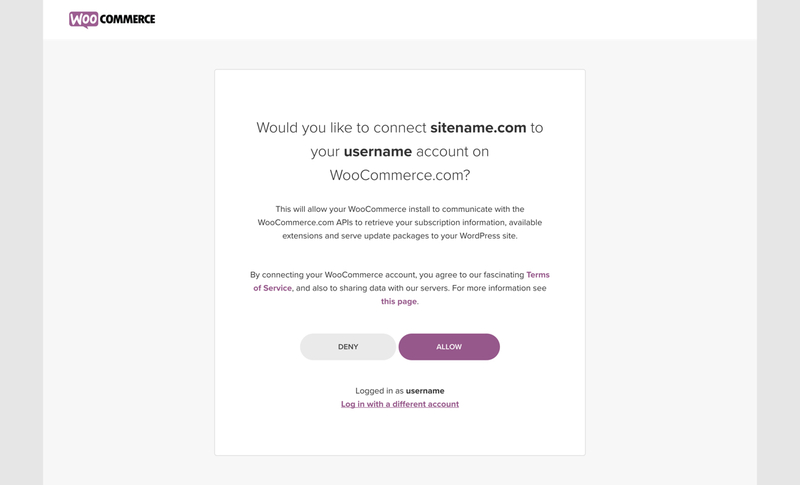 3/ Enter the email address of the WooCommerce.com account you want to share the extension with. 4/ Confirm the email address. 5/ Click the Share button. On the next screen, a prompt asks you to confirm the sharing of this extension. Note that this only shares use of the extension; both the ownership and billing remain with the original owner. If you prefer to transfer the extension – you can do so by following the steps above. 6/ Click the Confirm button if you are happy to proceed. In My-Account of the customer who is receiving the shared extension, they are able to see the shared extension listed, and the email address of the person who shared that extension with them once the extension is activated. Both sharing and transferring if disabled on shared extensions for the person with whom the extension is shared. 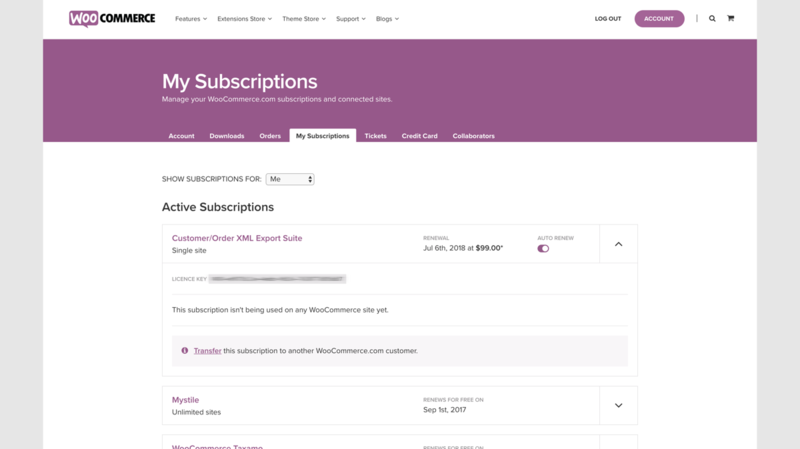 In the connected WooCommerce.com Subscriptions tab within WooCommerce Core, the shared extension is now visible. This extension can then be download and installed, and updates are available as long as the original subscription remains active. If you need assistance connecting your WooCommerce site to your WooCommerce.com account, follow these steps. In My-Account of the person who shared the extension, they can see the email address and the site URL on which the extension is being used. They can also deactivate the connection if they wish and also remove the share, if wanted. Directions for the former WooCommerce Helper are still available for the old WooCommerce Helper, but are no longer being updated. We recommend updating to version 3.1x or above to simplify management of your account, extensions, and keys. WooCommerce – the most customizable eCommerce platform for building your online business. WooCommerce is ready to help you get the answers you need. WooCommerce will reply to your questions about Get extension name shortly. Has anything changed since you first reached out? Is there anything new that you’d like us to know? NEW: Put your store in your pocket – manage orders, track sales, and get real-time order alerts with the new WooCommerce mobile app (iOS & Android). By continuing, you agree to their use. Learn more, including how to control cookies. WooCommerce License Keys is a simple and powerfull license keys manager, that adds a new product type to your WordPress and WooCommerce setup, and lets you create and handle license keys that can be used to validate your licensed products. This plugin will enable your WordPress setup to act as a validator API (service) with endpoints that will let you activate, validate and deactivate license keys via HTTP requests; we provide various solutions (as PHP libraries, packages and documentation) to integrate the API with your products. Built-in validator API (with activation, validation and deactivation endpoints). Allows shipping for physical products. Customers can manage their purchased licenses from WooCommerce’s My Account page. License Keys can be viewed by admins. License Keys are added to WooCommerce’s order completed email. SDK and libraries to implement easily the validations on your products. Limit your license keys per activations. Limit your license keys per domain. Allow your license keys to be installed on development environments without increasing your clients limits. Allow your “License Keys API” to include the downloadble file information, as part of the license key data when the activate and validate endpoints are called. The downloadable information can be used later to perform update checks. Allow your license keys to stay valid on offline environments and control the allowed offline time. 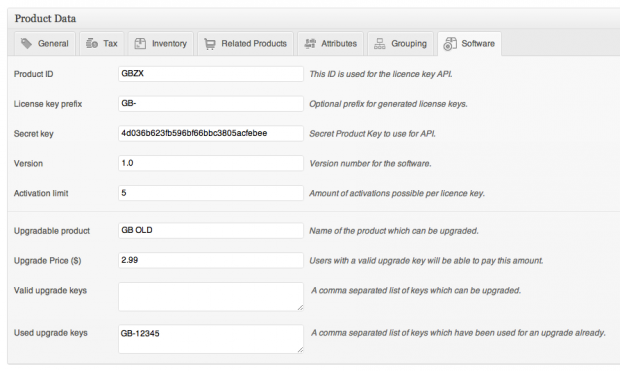 Customer license keys can be managed and edited by admins in WordPress dashboard. License keys activations can be deactivated by admins in WordPress dashboard. Manually extend expiration dates in WordPress dashboard. Allow your customers to extend their license keys that are about to expire by re-purchasing the product. Allow your customers to renew expired license keys by re-purchasing the product. Automatically send expiration warning notifications (needs wordpress cron to be setup on your site). You can opt to obtain these features here. License Key tab and options when adding or editing a product. Note: Some features displayed are from the extension we offer. Customer’s "License Keys" option at "My Account" page. 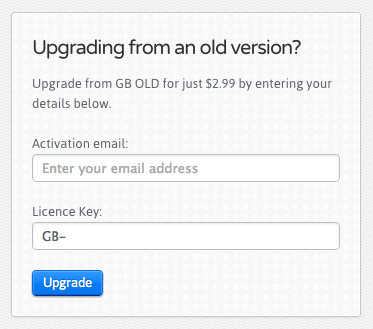 Note: "Renew" and "Extend" buttons are only available with our extended features. Customer’s "License Key" page view at "My Account" page, with no activations. Customer’s "License Key" page view at "My Account" page, with activations. License key list per order’s item at WordPress dashboard. License key product, with expiry, added in shopping cart. Head to your WordPress Admin Dashboard and click at the options Plugins then Add new. Search for this plugin usign the search input or if have downloaded the zip file, upload it manually. Integrate the validator API at “WooCommerce->Settings->API->License Keys API”. Install and activate the plugin. Follow the settings documentation to integrate the API with your products, these are located at “WooCommerce->Settings->API->License Keys API”. The plugin comes with a built-in validator API that does this job for you. Follow the settings documentation to integrate the API with your products, these are located at “WooCommerce->Settings->Advanced->License Keys API”. For full documentation click here. Or follow the quick documentation in the plugin, located at “WooCommerce->Settings->Advanced->License Keys API”. My Account > License Keys option not displaying? Refresh and flush permalinks. To do this, go to “Settings->Permalinks” at your WordPress setup and click the “Save Settings” button. How to modify a template? Customizable templates are located at folder /templates inside the plugin. Follow WooCommerce guidelines to modify them. Aside from the templates provided by this plugin, use WooCommerce template single-product/add-to-cart/simple.php to customize the “Add to cart” button. At the time this document was created, we only tested on WordPress 4.9.4, we believe, based on the software requirements, that any WordPress version above 3.2 will work. Which WooCommerce versions are supported? At the time this document was created, we only tested on WooCommerce 3.3.3, any version above 3.3.3 will work. Which PHP versions are supported? Any greater or equal to 5.4 is supported. “WooCommerce License Keys” is open source software. The following people have contributed to this plugin. “WooCommerce License Keys” has been translated into 1 locale. Thank you to the translators for their contributions. Added errors output format options for API responses. Fixes copy to clipboard on Firefox and other specific browsers. Added CORS control options in WooCommerce settings tab. “Copy” to clipboard option added for customers to copy license key displayed on “My Account” page. Tutorial link added to documentation. Fixes license key url with different permalink settings. WPMVC changes: Cache folder and disabled unused auto-enqueue setting. Ability to search for customer license keys in orders using the “search” tool found in WooCommerce orders admin dashboard. Fixes WooCommerce hook change related to order bulk actions. More customization hooks on API endpoints. Adds better support for desktop products. Fixes WooCommerce “Not doing it right” notices. Fixes reported WooCommerce “Not doing it right” notices. Automatically expires generated license keys on orders updated to status cancelled, refunded or failed. Fixed bug that was re-generating license keys when an order was set as completed multiple times. Fixes bug that was trying to display un-existent license keys on admin order page, when order was not completed. Added extra hooks and rules for further customization. Displays license key expiry information in cart and checkout pages. Fixes compatibility issue (API settings link) with WooCommerce 3.4.0. Fixes fatal error generated when WooCommerce is not activated. Fixes order licenses bug realted to order status. Fixes License keys on order received page. License keys added to order received. License keys missing title added to order completed email.